City agencies developing a new plan for the public spaces and the neighborhood near City Hall are hosting a public workshop this afternoon to present initial proposals and accept community feedback. It's the first time proposed designs will be shared with the community, including some potential uses of the shuttered Brooks Hall below Civic Center Plaza. 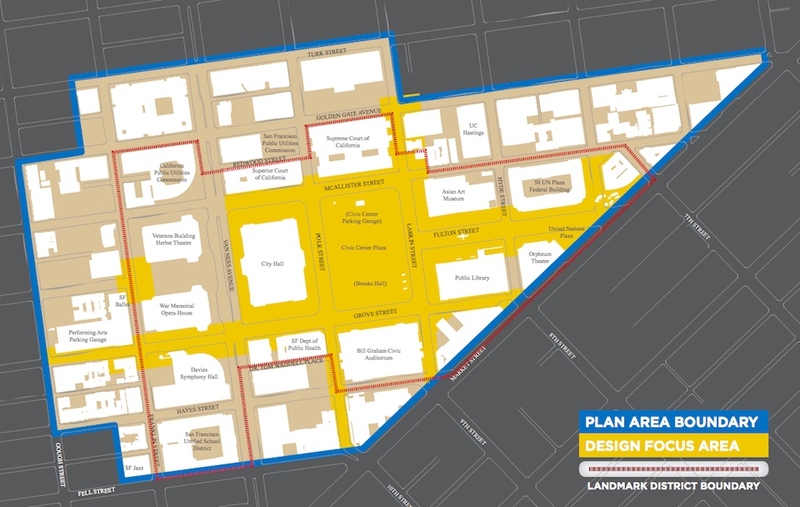 As we've previously reported, several agencies and community groups are developing a plan to align the design of three public places: UN Plaza, Fulton Street between the Main Library and the Asian Art Museum, and Civic Center Plaza in front of City Hall. The effort is expected to make the area more welcoming and appealing to neighbors, rather than just part of workers' commute routes. 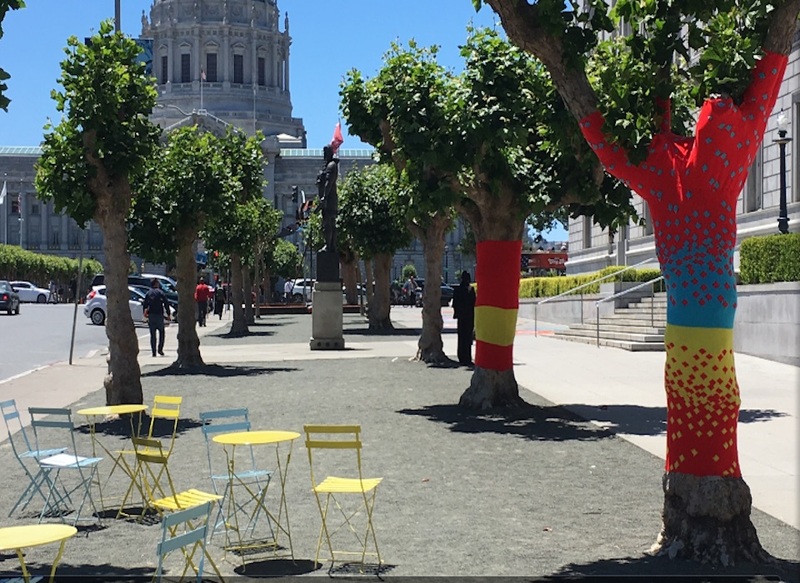 "The city is already working on new strategies for taking care of these spaces," said SF Planning spokesperson Gina Simi. 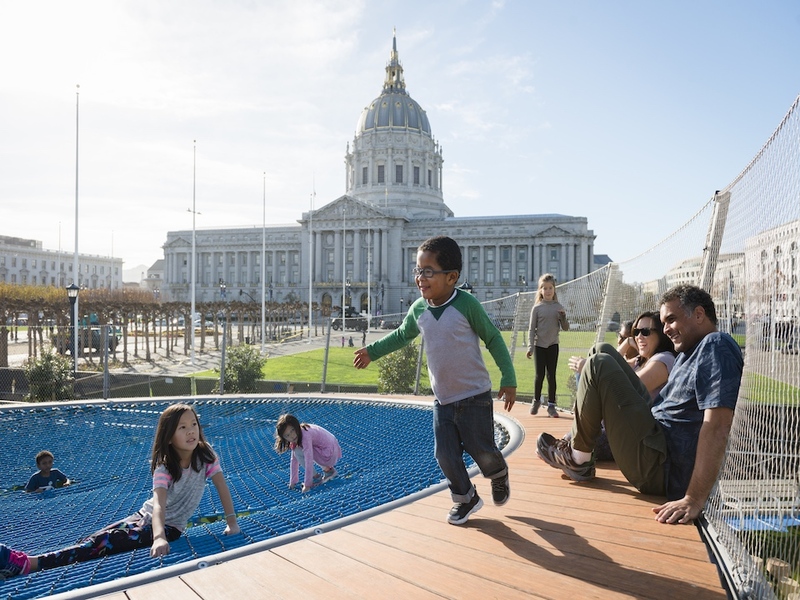 The Helen Diller playgrounds recently reopened after months of renovation, and a new street cafe managed by Bi-Rite is expected to open at the corner of Fulton and Larkin this summer, SF Rec and Park spokesperson Connie Chan said. 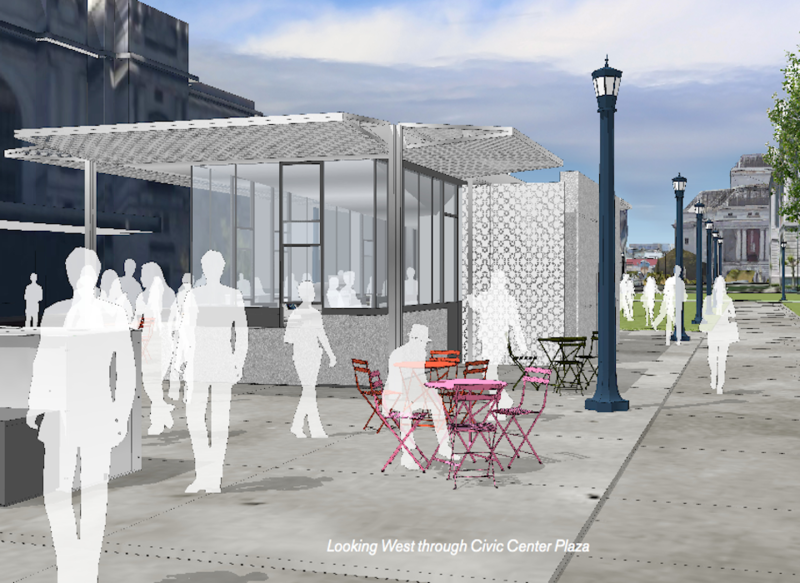 The Civic Center Commons Initiative has introduced movable tables and chairs to the area, a regularly staffed permanent information kiosk, and stewards are helping with public engagement and cleaning up the neighborhood. Those near-term improvements are only the start of the changes under consideration, however. Long-term options presented during the workshop today will include various levels of open lawn space, flexible areas for public art and activities, and other programming efforts, Simi said. Mobile tables and chairs near yarn-bombed trees. The workshop will also present three options for a revival of Brooks Hall, a massive underground convention center that's now used for city storage. "The project team has developed three different conceptual scenarios for reusing the Hall," Simi said. A Civic Center Public Life study issued last month found that the area has all of the attributes of a neighborhood, but the majority of services and retail cater to workers who leave the space at the end of the work day, rather than local residents. 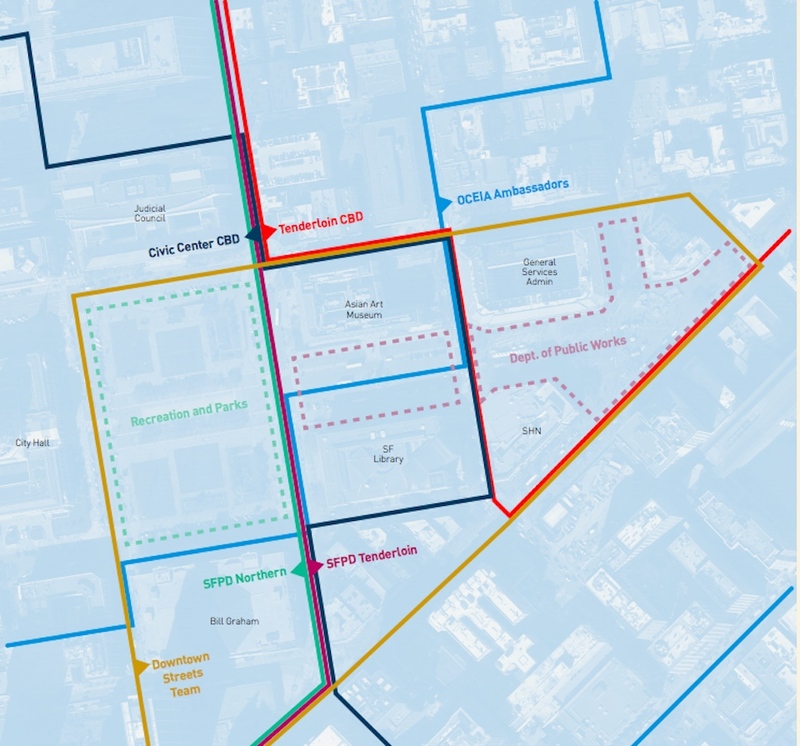 The new public realm plan aims to bring some of the activitity that currently borders the area into the public space and keep it open after typical business hours. 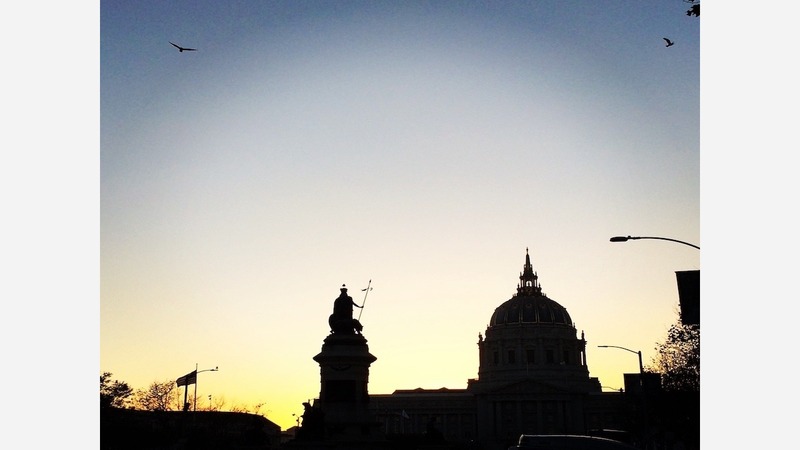 Among the more significant challenges to unifying the Civic Center Public Realm are highly-trafficked streets--Polk, Larkin, and Hyde--that break up the visual axis from Market Street to City Hall, the study found. Large, single-use buildings like government offices, performance spaces and museums create "long, inactive facades with few openings and very little transparency," leaving the center of Civic Center dull and unattractive to nearby tenants, according to the study. 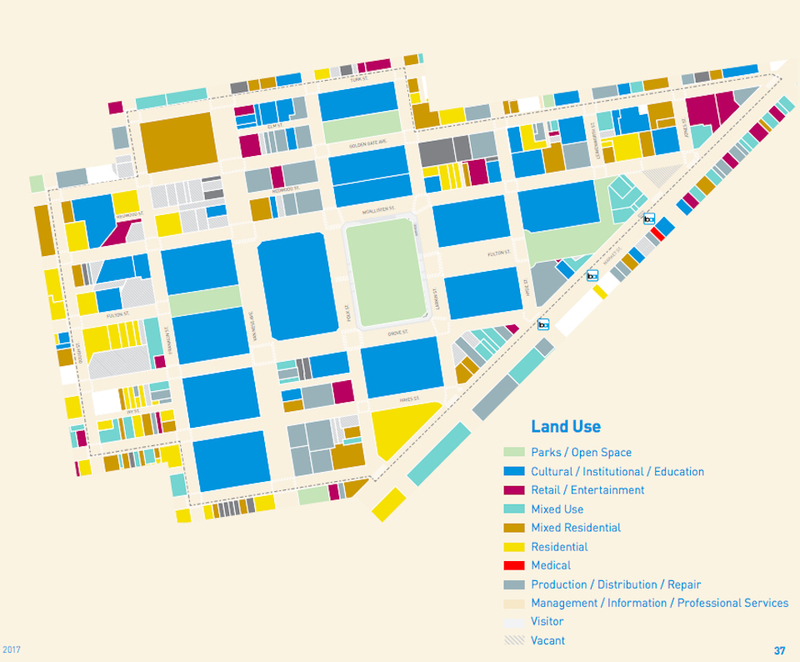 Another challenge: the area's governance is overseen by a slew of organizations: Rec and Parks department oversees the playgrounds, Public Works maintains the roadway and UN Plaza, and the Civic Center and Tenderloin Community Benefit Districts divide the area along Larkin Street. The neighborhood is also split by two police jurisdictions: the Tenderloin and Northern SFPD districts currently each border Larkin Street. The overall public realm plan is about halfway through its design and community engagement process, said Simi. An online survey, available in multiple languages, will collect more public feedback starting on May 1. Survey responses will be accepted until June, and some physical surveys will be distributed during an upcoming Heart of the City Farmers Market, Simi said. Community feedback will help agencies narrow down possible design options into one preferred plan, which will then have to go through environmental review, Simi said. The goal is to present the preferred plan by the end of this fall, she added. The environmental review is expected to take two years, and adoption hearings on the plan are unlikely before 2020.